The Pearson Team played away at Porters Park on Monday, congratulations to Nikki and Kathy M who secured wins but unfortunately Porters Park ran out 5-2 winners. The team have 2 more matches in quick succession this week, away at WGC on Monday and then a rescheduled match home against Porters Park on Wednesday. Good luck to all. The Scratch Team played their first match of the season on Friday at home to Veralum. The course was now in great condition and in very hard fought matches the overall result was a halved match! Well done to Vicky who made her debut for the team and won her match! The Australian Spoons competition took place on Tuesday in windy conditions. The top pair after the qualifying round with 36 points is Hazel and Anne. Don't forget you can play as many times as you like between now and the closing date in June AND you can change your partner if the first one was rubbish!!! 🤪 there is a sheet up on the board with further details but any queries please contact Kathy Morris or Pauline Humphrey. You might qualify for the next round at Hanbury Manor but I think you will need more than 36 points! Good luck. The week culminated in the Jubilee Jug, held on the hottest April day for 70 years...! 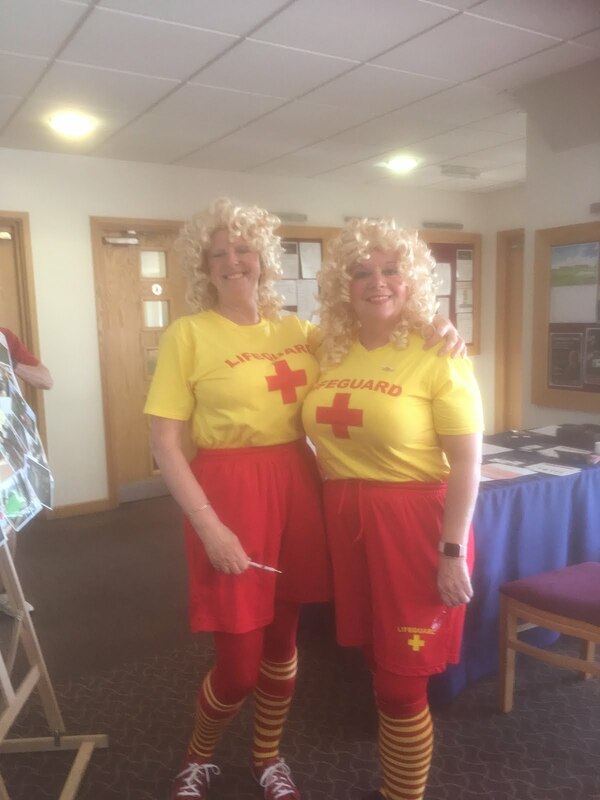 It was a fantastic day and thanks to all who got into the spirit with some great outfits (some not designed for the heat!) and gave generously to the Essex and Herts Air Ambulance. it looks like we raised in the region of £300 and had a lovely afternoon tea too. 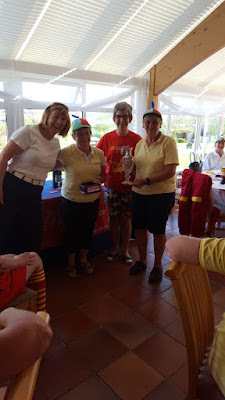 There were some great scores posted and congratulations go to Hazel and Katy who won the trophy with 46 points 🏆 the other places on the rostrum went to the Julies - Price and Retallick, and Barbara and Vicky both with 43 points. The judging for the Best Dressed pair was really difficult but Chris and Di took the fizz on this ocassion. I hope you all enjoyed it as much as I did. There are lots of pics to view on Club Facebook page. Life moves on a pace now and the sign up sheet is now on the board for the Spring Meeting on May 10th. We will draw the 4 balls for this a week before and it will be a Team Alliance format followed by lunch and Prize giving of the trophies and Cups so far this year. Cost is £18 - payment to Pat via the usual methods. If any of you wish to just join in for lunch and prize giving please also sign up and the cost is £16. There will also be a raffle and prizes for the golf on the day.